If you've been a regular reader, then you probably know about my undying love for Japanese cuisine. However, I haven't told you a lot about my other favorite food items yet. And in this entry, you'll get to uncover another one. Yes, you got that right. I've always been in love with oats! That's why I was so excited to try out Oat Square in Quezon City. 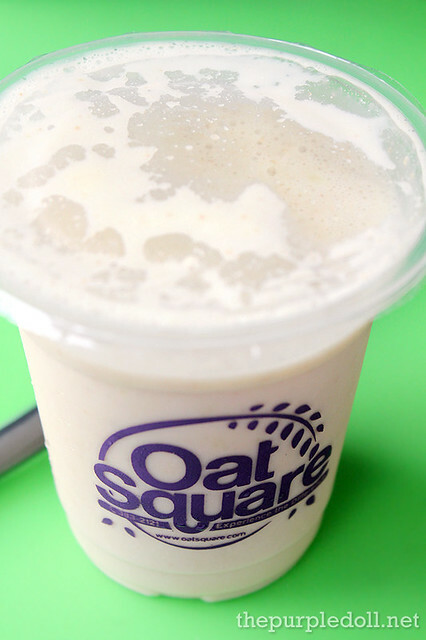 Located in Scout Madriñan corner Tomas Morato, Oat Square is a fairly new snack house offering wholesome and nutritious drinks and sweet treats all made from healthy ingredients and infused with the goodness of imported oats. 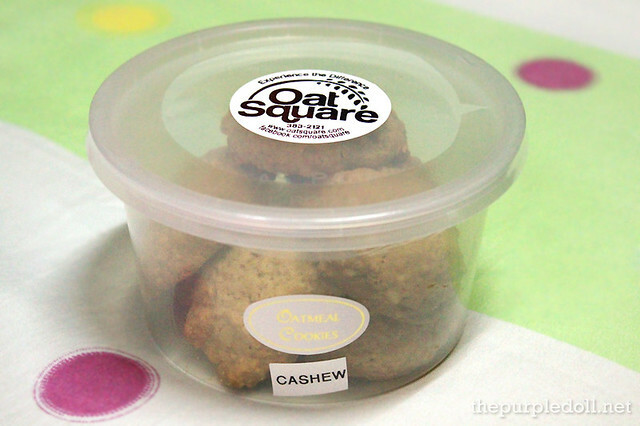 And while there have already been oat-infused desserts specifically oatmeal cookies available in other stores, Oat Square remains the first of its kind in the Metro -- a specialty food shop focusing on oats. Since I wasn't feeling well that particular day, I brought the driver with me and got him the classic Choco Blast (12oz. P50; 16oz. P60) while he wait for the food tasting to be over. Of course I didn't dare get a taste of his drink, but he said it tasted light and chocolatey with bits and pieces of oats. I was also thinking it might somehow be similar to Singapore's Milo Dinosaur since the drink had powdered chocolate or Milo on top. Aside from drinks, Oat Square also carries a variety of snacks perfect for merienda. 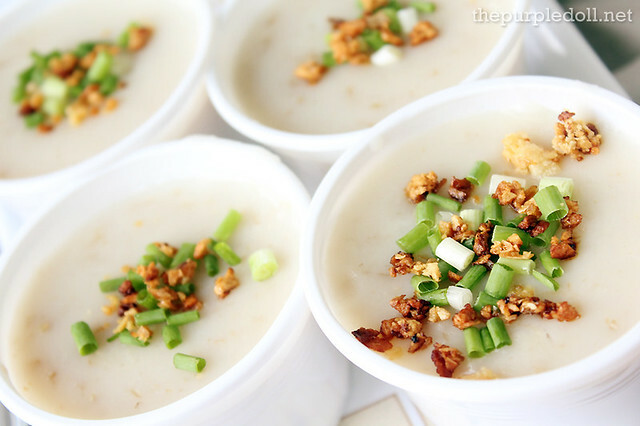 One of the newest items is their Oatz Caldo (P60) which is warm and comforting just like your regular arroz caldo, but is made of oats instead of rice. This tasted so homey, yet at the same time, cuts back on the calorie content. Perfect for those on a diet! While I'm happy with the drinks and the oatz caldo, it was their pastries which had me continuously nodding with approval. 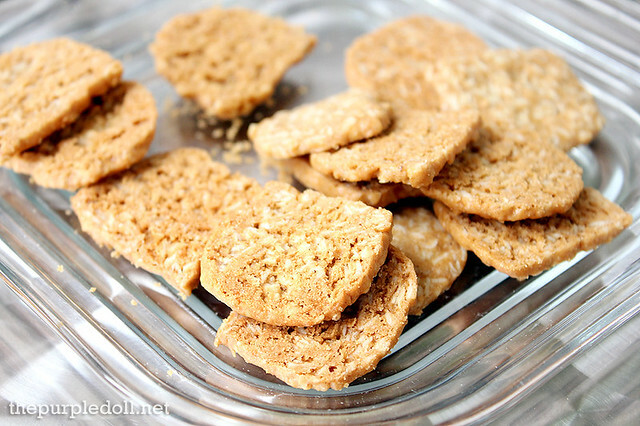 My most favorite among the ones we've tried was the Oat Niblets (60g P60; 90g P90) which are thin crispy pieces of high-protein oatmeal cookies. Seriously, these are so addicting! They're not sweet, nor chewy unlike most oatmeal cookies around, yet they'll surely please everyone who takes a bite. I got to bring home a pack, and even my little sis who's not much into cookies or oatmeal, loved these! We also got to try the Oat Brownies Niblets (60g P120) which is almost the same as the oat niblets, but infused with the goodness of chocolate. Compared to the oat niblets, I really like how these babies look more crispy. And while they taste really good and quite chocolatey, I have to say, my heart and palate still belonged to the plain oat niblets. I also bought a pack of Cashew Oatmeal Cookies (P135 for a box of 8 ) which is as equally moist and as chewy as the walnut ones. However, I prefer these a wee bit since I'm a big fan of cashews. 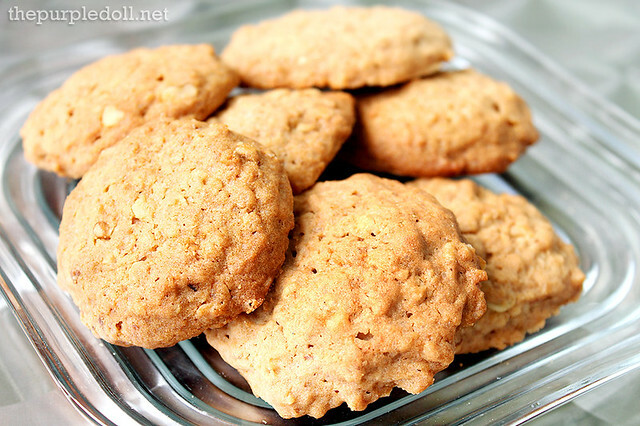 I didn't take a photo of the cookies anymore, but they look really similar to the walnut oatmeal cookies, but had cashews instead of walnuts. 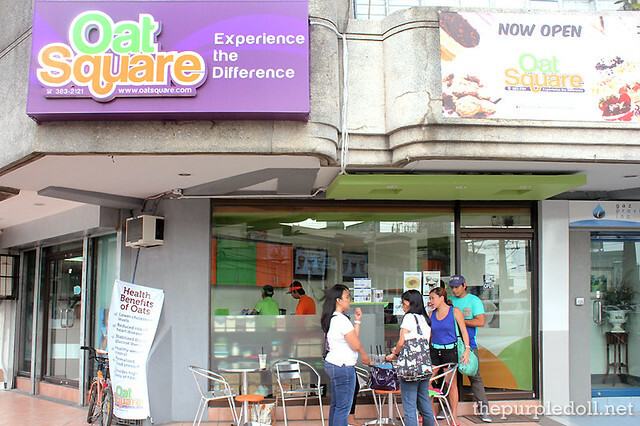 Although Oat Square has only opened August of this year, they're already growing a following, especially with the working crowd in the Tomas Morato area. 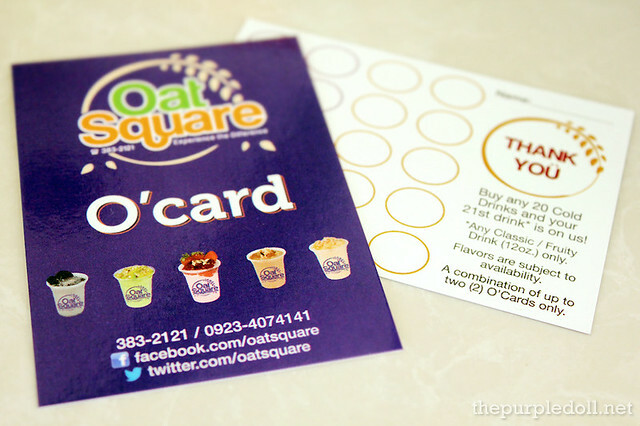 And if you frequent Oat Square and have plans to pay it regular visits, I suggest you grab their loyalty card, the O'Card where you get to avail of a free 12oz. 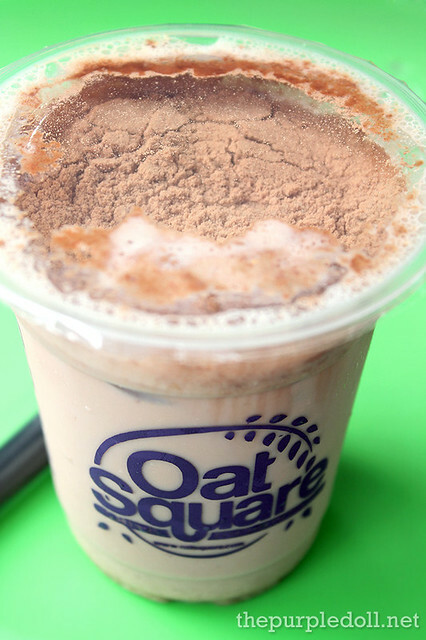 classic or fruity drink after you collect 20 stamps (1 stamp = 1 cold drink from Oat Square). For an oats lover, Oat Square is definitely a nice change from my usual hot chocolate oatmeal bowl. Aside from healthy and refreshing soy and oat-based drinks, Oat Square also has their Oatz Caldo and homemade pastries to boast of. Personally, I find their niblets and cookies to be really of impressive quality compared to their drinks which are generally good too, but not as amazing. So for my next visit to Oat Square, I'm sure to grab a pack or two of their niblets and cookies, as well as try out their Healthy Oat Pops. Oats are healthy too. What about the price? Is it affordable? Oat Square seems to be a posh place. As a health conscious person, these are great foods that I should try. what a cool innovative resto! Cool, it's my first time to learn about this Oat Square place. My usual breakfast is a bowl of oatmeal and I love to eat chewy oatmeal cookies. Hope to be able to visit this place when I get a chance to drop by Tomas Morato area. :) It's a healthy alternative too! Coloud The Knock Headphones + Giveaway #5!